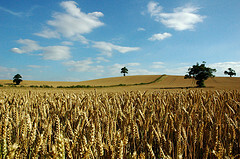 Picture a field in which someone has planted wheat. We imagine the harvest from that field to look lkike a farmer using equipment to cut down the wheat, thresh it, and seperate the seeds from the stalks. Now imagine a geologist a biologist and a painter harvesting from the same field. The geologist picks through the rocks and soil gathering data about the land itself. The biologist might collect insects and worms, bits of plants and organic matter. The painter sees the patterns in the landscape and chooses a pallete and a perspective for work of art. They all harvest differently from the field, and the results of their work go to different places and are put to different uses. But they all have a few things in common; they have a purpose for being in the field and a set of questions about that purpose, they have a pre-determined place to use the results of the harvest, and they have specific tools to use in doing their work. What’s useful to note is that, despite the field being the same, the tools and results are specific to the purpose and the inquiry. It is like this when we meet. There is much we can do, but a well thought through inquiry helps us to sift all that we might learn in the meeting to that which serves our purpose. When we can design questions that open up our curiosity, think through how we might use the results of our work and use the tools appropriate to the task, we can go deeper into our tasks and acheive emergent, innovative and better quality results. So just try this for the next meeting you are a part of. Give some time before hand to create a little inquiry: “What am I curious about in this meeting?” Think in advance how the results of that inquiry will help you work better, and decide on at least one way in which you will use what you have learned. See if that doesn’t create just a little more engagement and createa little more momentum for the results.